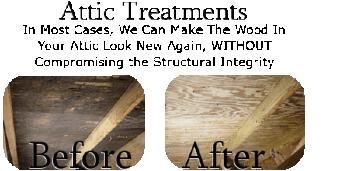 The very first project our company completed was an attic abatement project. We complete 40 to 50 attic mold removal projects per year. A majority of these transactions take place during the selling of the property. Home inspectors find mold covering the framing and sheeting, often caused by poor ventilation. 1. Insulation blacking soffit vents. 2. Lack of soffit vents. 3. Bathroom fans improperly vented into attic or soffit vents. 4. Not enough or improper exhaust ventilation. 5. Tuck pointing needed, chimney leaks. 6. Ice backup due to lack of ice guard. We investigate, during the estimate, the cause of the mold problem and devise a protocol to correct both. IF YOU DO NOT REMEDIATE THE CAUSE OF THE MOLD, THE MOLD WILL KEEP COMING BACK! We can correct both the cause of the mold issue and perform the mold removal as well. 1. 8 year waranty 2. Non toxic chemicals 3. Over 30 yrs experience between our technicians. 4. All technicians carry certifications for abatement activities. 5. Competitive quotes. 1. Crew will introduce themselves to the homeowner. 2. Plastic carpet runner will be used to create protected walkway to work area. 3. Crew will create a negative pressure containment using thick 6mm poly ethelene sheeting and AFD's, creating a minimum 6-8 air changes per hour. 4. Crew will don protective gear, and insulation will be pulled back from soffits to improve intake ventilation and bathroom vents will be exhausted and ducted properly. 5. All contaminated areas will be hepa-vacuumed to remove surface mold spores and mycotoxins. 6. Cosmetic stain removing will be used, if asked for, to remove stains from wood. This is merely a cosmetic benefit of the process, yet it does provide aesthetic appeal. 7. Benefect will be used as the preliminary disinfectant to kill any remaining mold. Benefect will be sprayed and fogged in the attic to penetrate every square inch of the attic space. 8. Tim-bor, a non-toxic borate chemical, will be sprayed in the attic to act as an inhibitor against any further regrowth of mold. 9. The containment will be broken down and crew will leave after you are pleased with the work.